"Yay, it's a Friday!" or as we say in this house "Yay, mae'n ddydd Gwener!" 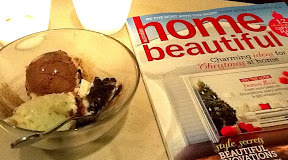 The scent of Christmas is wafting through the air from a couple of tea lights, my untouched magazine is patiently waiting to be opened and some triple chocolate ice cream called out my name from the depths of the freezer! May it be an abundance of relaxation and happy times. I hope you had a lovely evening, seeing as there was ice-cream involved it must have been pretty good. I jumped in bed and ate cookies and cream ice-cream! Ps thanks for your lovely comment. I know! I'm late! I've had a screen free weekend so am only now catching up. Our weekends are busying up now. Wonder if there is any ice cream in the depths of our freezer? Nah, probably not. It's only small so no depth to it whatsoever. Bummer! Can I share yours? Sounds like heaven to me Beth...Ooooh I better get my mum to grab me a copy of that! Is that the Dec issue? ?